Informal Recruitment, or Continuous Open Bidding, is the process that sororities use to recruit new members. Unlike Primary Recruitment, a Potential New Member engaged in Informal Recruitment will not visit all of the sororities. When a sorority decides to offer Informal Recruitment, they contact Potential New Members through the forms that were filled out by Potential New Members and hold a series of informal events to get to know her better. Registration on the part of the potential new member is necessary to join a chapter. All women that have not been initiated by another chapter in the past are eligible to participate! Informal Recruitment almost never involves all of the PHA sororities at any particular time. Those who do take part usually have only a few spots open for new members. Therefore, the opportunity to join a sorority during Informal Recruitment is much lower than during Primary Recruitment. Informal Recruitment is a much less structured process. You do not get the overall view of Sorority Life, nor do you see what each sorority is about. Most of the women who join through Informal Recruitment do so because they have been on campus for a while and have a better feel for which sororities they would be comfortable joining. For many reasons, including wanting to get to know all the sororities, most women choose Primary Recruitment as their way to join a sorority. However, if you find that you are unable to go through Primary Recruitment for any reason, keep in mind that Informal Recruitment may occur each Fall and Spring semester. This means that the chapters participating in Informal Recruitment will vary throughout the year. Panhellenic Recruitment functions in two ways: primary and informal. The majority of sorority women join chapters through Primary Recruitment, which takes place every Fall the week before school begins. PHA Recruitment is a mutual selection process where a potential member has the opportunity to meet with chapter members, ask a variety of questions, and tour the living units. Learn more about BOTH forms of Panhellenic Recruitment on Mizzou’s campus. Registration for Primary Recruitment 2019 will be open from Monday, June 3 at 9 a.m. to Friday, July 26 at noon. Late registrations are NOT accepted and NO EXCEPTIONS will be made. For participants who live on campus, move-in will take place on Saturday, August 10. Specific move-in times vary by Residential Hall. For participants who live off campus, lodging is your own responsibility. You will be given a dining hall card for your lunches during Primary Recruitment. An optional profile picture upload will be on the second page of the registration. Photos must be 1) taken in front of a plain/blank background 2) passport style photo: shoulders up, head facing forward. If your photo does not meet the requirements, a new photo will be requested. The new photo will sent to pharecruitment@missouri.edu. In order to register you must upload a copy of your latest transcript. This could be in the form of official, unofficial, or latest report card. Students must be fully admitted to the University in order to register. It is HIGHLY recommended that women participating in primary recruitment or non-primary recruitment have at or above a 3.5 cumulative high school or college GPA at the time they are seeking membership. In Fall 2017, the average GPA of women who participated in Primary Recruitment was 3.74/4.0. Visit the FAQ page for more information. If you are sophomore university student partaking in primary recruitment it is HIGHLY recommended that you have a 3.0 GPA or higher. Once your registration is completed you will not be able to login and make changes. Have questions about primary sorority recruitment? Check out Recruitment FAQ! Can’t make it to Bid Day? Join the celebration via Livestream! Mizzou Film Crew will be filming all the festivities and streaming them at 12 p.m. CDT. Venue Information: Upon arrival, registered spectators must check in and obtain a wristband. Spectators will be able to watch the Bid Day Celebration from the grass area located southeast of the field. Feel free to bring a blanket or lawn chair for comfort during the celebration. 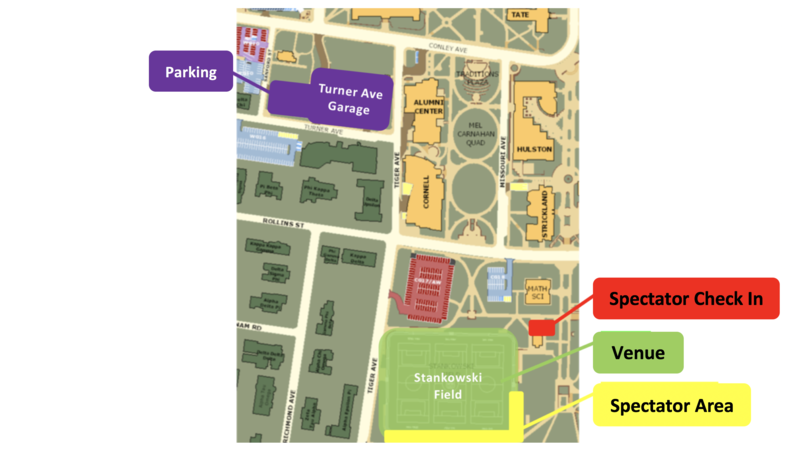 Parking: Spectators are encouraged to park in the Visitor Parking at Turner Avenue Parking Structure. Weather Information: If Bid Day 2019 gets rained out the celebration will be taking place in Brewer Fieldhouse. Due to capacity, no spectators will be able to attend. Weather decisions will be communicated to registered spectators via email. Questions? Contact Brooke Bernstein, Vice President of Membership Education, at phamembereducation@missouri.edu.